More often than not, many of us wish we had a bigger kitchen. Cooking in a small or cluttered kitchen can be difficult. It’s hard to move around and find what you need. We previously talked about kitchen organization in our post DIY Kitchen Storage. 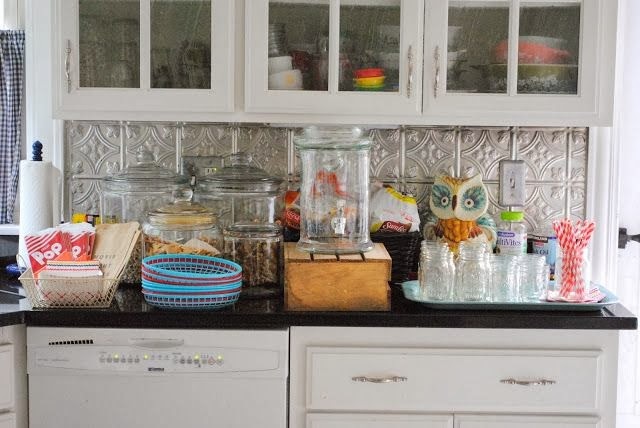 In this post, we’ll share some pointers for organizing your kitchen. Organizing a small kitchen can really help open up some space and make cooking easier. The inside of the cabinet door is your new best friend. There’s wasted real estate in your kitchen in the form of the back of cabinet doors and pantry doors. You can add hooks on the back of cabinet doors and use them for hanging small utensils and measuring cups. 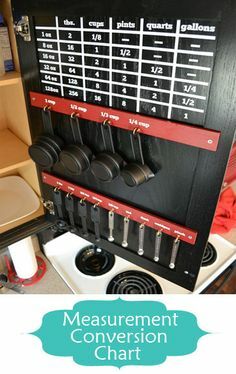 You can even create a cute display by placing a list of measuring equivalents above your measuring cups. Alternatively, add small shelves to the backside of doors if they fit. Cut veggies on top of the sink. Use an over the counter cutting board. It will help you take up less counter space while prepping your food. Give fake drawers a real purpose. 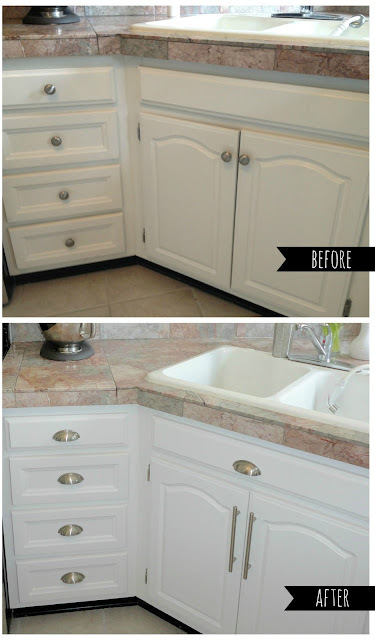 Use fake drawers for paper towel storage or modify them to hold items. To make a paper towel holder, remove the front of the fake drawer and install a paper towel rod. Why have fake drawers when you can have real ones, especially when you need more space in the kitchen? Install a DIY pegboard. Create more storage space using a pegboard. Did you know Julia Child used this method to store her large collection of pots and pans? 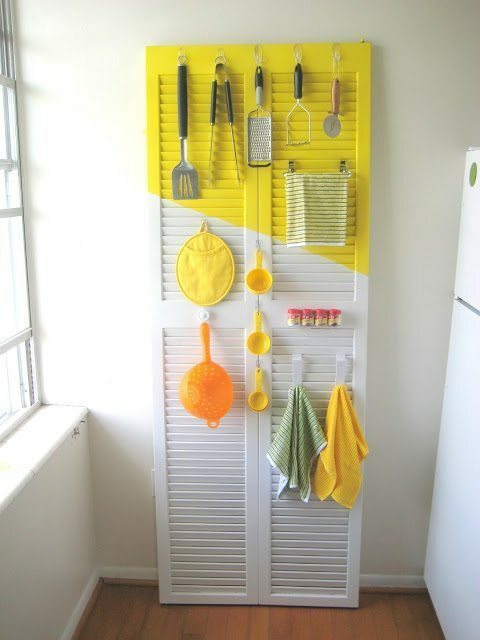 This method frees up cabinet space by keeping items on the wall. The items on your pegboard will also be easy to reach and take down, and with a pegboard, you don’t have to stack pots and pans. Say goodbye to wasted space. Add shelves to unused wall space. Adding more cabinetry may be impossible or too costly, but it’s easy to add shelves and hooks. Hang items like pots and pans and hang utensils on the sides of cabinets. Get to corners. Say hello to the Lazy Susan. These storage devices can turn and make the space in corners more accessible. With a Lazy Susan, you can fit more into the space. Use magnetic forces to your advantage. 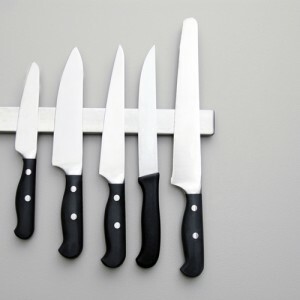 Put a magnetic strip on the wall for holding kitchen knives. This saves counter space and drawer space and keeps knives high up and away from small hands. You can also use magnets to move your spice rack to the front or side of your fridge. Just put your spices in small jars with magnets on the back. This frees up counter space and cupboard space . Roll-out storage is easier to reach. Add roll-out shelves to your cabinets, pantry and the under the sink space. This helps you store more in those hard to reach areas. Don’t let any space go unused! Invest in a storage cart. Storage carts are an inexpensive and easy way to add additional storage to a small kitchen. What storage tips and tricks have helped you get by in a small kitchen? Check out Living Large in a Small Space by Zircon for more ideas. This entry was posted in Cleaning the Kitchen, Kitchen DIY, Kitchen Tips and tagged Cookware and bakeware, do it yourself, Julia Child, kitchen, Kitchen cabinet, Lazy Susan, Organizing, Perforated hardboard on October 7, 2014 by editor. Summer is finally here! You may finally have the time you need to work on the kitchen remodel you’ve been thinking about all year. As you plan your remodel, or the DIY projects you’ll be tackling, we’d like to take this blog post to remind you of contemporary kitchen trends you can exemplify in your kitchen, including installing a large kitchen sink, picking out an oversized light fixture and more. White is a classic kitchen color, but gray is trending right now in kitchens. In fact, you can play it safe by painting the kitchen a neutral color and installing cabinets that come in a neutral color. Later, you can accessorize with bold colors. Accessorizing with bold colors also gives you the freedom to change out these colors as trends change, because accessories are less costly to replace than larger kitchen items. Other trending colors include black and white schemes and the mixture of light and dark elements. When it comes to light fixtures, sometimes bigger is better. Interior designers are going with oversized light fixtures to create a statement and a focal point in the kitchen. Large kitchen sinks and apron-front kitchen sinks are also becoming popular. Remember, pots and pans are easier to clean in large sinks. 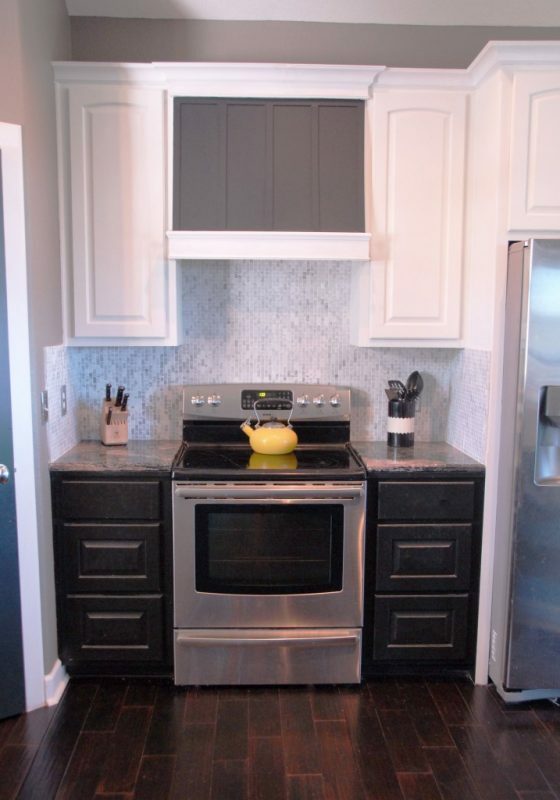 To really spice it up, install a colored kitchen sink. As for countertops, some designers are mixing materials, such as using natural stone and wood in the same kitchen island. More realistic look-a-likes are also popular, including laminate that looks like granite. Other popular materials include quartz, which comes in a variety of colors, is heat resistant, resists stains and scratches and is nonporous. One more countertop trend includes adding more space for cooking and preparing food. The last kitchen trend we want to go over in this post is kitchen tech and smart appliances. These are making a big appearance in contemporary kitchen design. Today, more kitchens include motion-activated lights and faucets. The lights save energy and the faucets are hygienic. What will you be including in your kitchen remodel this summer, and what are your favorite design trends this year? Good luck with your renovations! 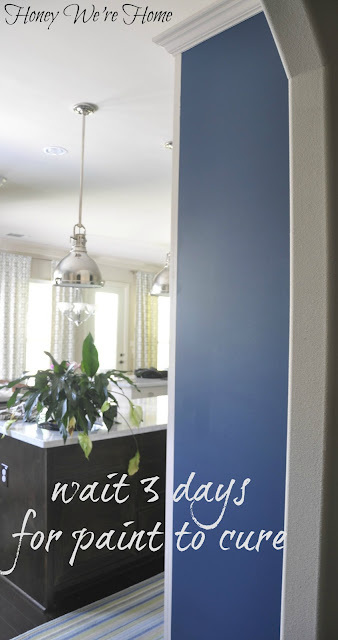 This entry was posted in Kitchen Design, Kitchen Tech and tagged design, diy, do it yourself, HGTV, interior design, kitchen, renovation, sink on July 17, 2014 by editor.